The world lost another pioneering singer/songwriter today (1.19) when Denny Doherty, a founding member of The Mamas and The Papas, died after a short undisclosed illness. He passed away at his home in Mississauga, Ontario near Toronto, at the age off 66. 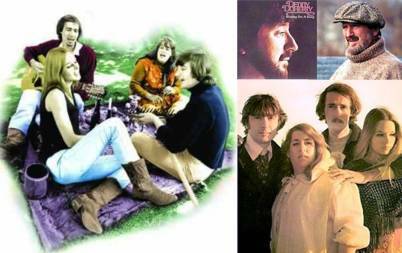 The Mamas and The Papas were a Grammy winning folk/rock group off the Hippie Era, known for such classics as “Monday, Monday” and “California Dreamin’”. The band also included the late Mass Cass (Elliot), who died of a heart attack at the age of 32 in 1974, and Michelle and John Phillips, who were married for part of the time. Papa John (Phillips) passed away of heart failure in 2001. Sole band survivor Michelle Phillips is now a successful actress. In 1998, The Mamas and The Papas were inducted into the Rock and Roll Hall of Fame. Denny Doherty leaves behind his siblings Denise, Joan, Joe, and Frances, as well as his three children, Emberly, Jessica, and John. Denny actually started to sing publicly at the age of 15 when he was dared to sing Love Letters In The Sand at a skating rink. Denny worked in a pawn shop as a youth. In 1959 Denny assembled his first folk trio named The Colonials they later changed their name to The Halifax Three. next post: Attention! New Traffic Laws! 48 queries in 1.026 seconds.